In the retail business, trust is everything. Customers and partners rely on retailers to protect their personally identifiable information and payment data. It takes years and a lot of effort to build trust in a brand and business but only moments to see it all vanish in a major security breach. With the recent, rapid growth in organized cybercrime, ...consumers, and retailers and their data have come under increasingly frequent and sophisticated attack. And it’s no longer just payment card data at risk. Shopper personal data, proprietary financial and vendor data, and product and services development data all are vulnerable. 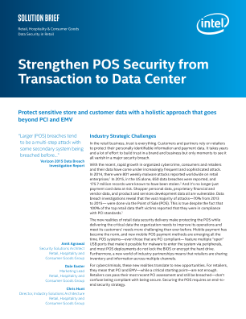 Data breach investigations reveal that the vast majority of attacks—70% from 2013 to 2015— were done via the Point of Sale (POS). This is true despite the fact that 100% of the top retail data theft victims reported that they were in compliance with PCI standards.